How many years may a theft loss be carried back from the year the loss is reported? ANSWER: The investment theft loss forms part of the taxpayer's operating loss that may be carried back or forward under normal net operating loss rules. Generally these rules provide for a three year loss carryback and 20 year loss carryforward (or "carryover") limitation. Is a theft loss deductible as a capital gains or ordinary income? ANSWER: The investor is entitled to an ordinary loss rather than just a capital loss. 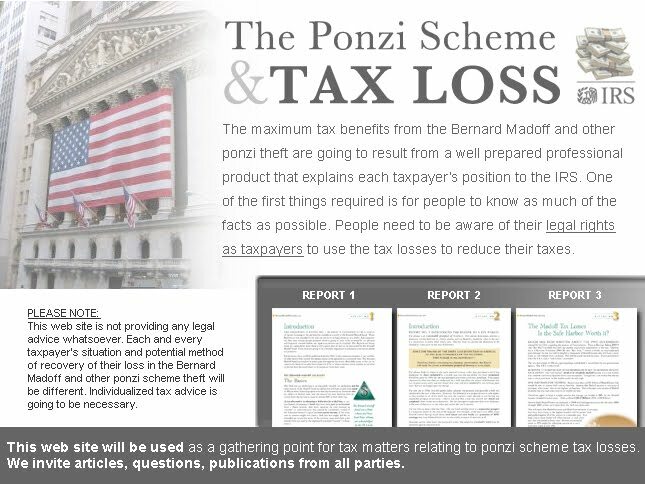 The IRS considered a Ponzi scheme theft loss to be a loss that is incurred in a transaction entered into for profit. Can a taxpayer claim a theft loss for income that was reported for tax purposes and not distributed to the victim. ANSWER: A taxpayer will receive basis for taxes paid on "phantom income" that was credited to the investor's account, whether or not it was paid to that account by the Ponzi scheme. REPORT NO.3: Is the Safe Harbor Worth it? Free 50-minute web seminar: This web seminar is for victims and financial professionals. Learn how recovery through the "Tax Refund" is quick and reliable. Richard S. Lehman, with a Masters in Tax Law from New York University Law School, with four years of U.S. Tax Court and Internal Revenue Service experience in Washington D.C.
With over 35 years as a tax lawyer in Florida he has built a boutique tax law firm with a national reputation for being able to handle the toughest tax cases, structure the most sophisticated income tax and estate tax plans, and defend clients before the Internal Revenue Service. The firm regularly works with law firms, accountants, businesses and individuals struggling to find their way through the complexities of the tax law. In short, the firm is a valuable resource to each of these audiences.